With less than 10 days to the Massachusetts primary, let’s track how much love we get from the candidates and the media as the big day approaches. Or just how blatantly we are ignored. It is probably more obvious because we had a seat on the sidelines as the candidates and the media fawned over every voter and event in New Hampshire. The party has moved out of town, literally, and it will be interesting to see just how much anyone is going to value Massachusetts voters. Much of this is our own doing, as we schedule our primary on the day of the “SEC” Super Tuesday primary. The attention has gone south, and we are hiding in a dark, gold corner in the opposite end of the country. Bernie will be in Amherst on Monday, I expect we will have a few visits from Kasich (where our state will probably be his best chance for a win on March 1), but we seem to have been rendered into political insignificance. Whe do we do this to ourselves? New Hampshire voters won’t vote for a candidate who they haven’t met and questinned on several occasions, but we settle for media coverage from New Hampshire and the TV ads directed at the Granite State. Is there any hope for some attention between now and March 1? Is there something we can do, between now and 2020, to put us in a better position to have a meaningful voice in the presidential primaries? I assume those are for us, and MA is in play at least on the Dem side. I couldn’t tell you what my own alma mater is in without looking it up, though I do know we didn’t have a football team so basketball would be the indicator. I was wondering what the Securities and Exchange Commission had to with Super Tuesday. Trump had 2 large events in MA. I work in Lowell, and let me tell you, nobody was talking about anything else but Donald Trump for a week surrounding the event at the Tsongas Arena. Trump may not be a politician, or so he says, but he was smart and strategic enough to cross the state line into Massachusetts when he was holding a big event. It hit the Boston media market, got play in NH, attracted voters from NH, and showed at least some appreciation for MA delegates. 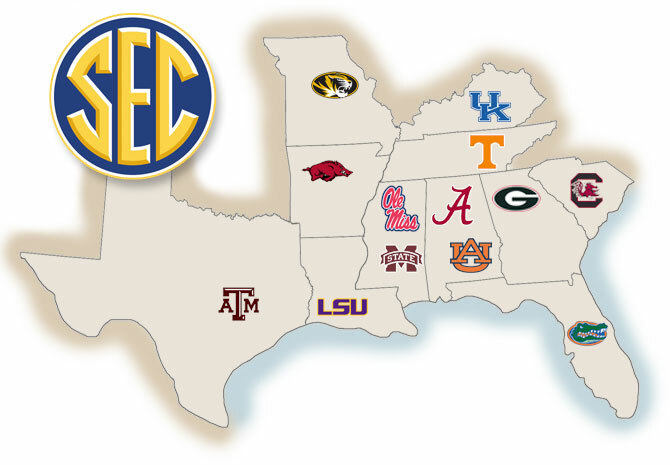 That’s just the SEC schools who have a women’s volleyball team — which is why, for example, Vanderbilt isn’t on that map. They should get a women’s volleyball team. It would put them on the map. The best kind of joke. 1) Go as early as possible (Super Tuesday or shortly thereafter). Pro: Almost ensures that the primary still “matters”. Con: Vying for attention in a short time span with a lot of other states. It comes down to how worthwhile the campaigns think it is to spend time in the state. 2) Go after the crowd. Pro: If there is still a contest, your state “really matters” during a time when there will be fewer states sharing the same election day (see 2008 Democratic contest). Con: Risk not mattering if everything is settled by Super Tuesday or shortly after. What can “we” do? Not much. If we had same-day primaries in all states, candidates would have to campaign across the whole country until that day, and the artificial bias in favor of places like Iowa and New Hampshire would disappear. *How* do we do that? The same way we make any other big change. It’s how most modern Westminster parties do leadership elections, but it makes it less likely you get an outsider like Carter, Bill Clinton or Obama winning. Obama’s win in Iowa was proof he was the real deal and brought black support flocking to him in later primaries. Had we done a national primary, even after a series of debates, it’s likely Hillary would’ve been our nominee, with a better known guy like Edwards probably coming in second. Depending on when you did it based on national polling Lieberman would’ve been our 2004 nominee. Bestowing this advantage on two of the whitest states in America is definitely unfair, but any proposed change should still allow a staggered process so that we can give outsiders a chance and make sure any frontrunner earns the nomination by going through the paces. All that would really do is make money in politics the single and only thing that matters. In the last 60 years, the only time MA voted for a Presidential candidate other than Democrat was 1952, 1956, and 1984. Why would either party want to court our votes when there are other states that are not pre-decided? It’s why GOP candidates don’t bother to even make a courtesy visit down from New Hampshire, and Democrat candidates treat the state like an ATM, without bothering to court us. ..also I have to say if MA is Kasich’s best hope on March 1st he is in a sad state. Trump is currently at 50% in the polls in a five way race. The post asked why we are not relevant. Your response is an excellent demonstration. If we even apportioned votes like Maine, we’d have a shot. As it is, nobody will spend millions to see how 11 blue votes go, and our opinion will continue to be written off. Best way to enfranchise Texas Democrats and Massachusetts Republicans I could think of. It’s easy, it’s fair, every single vote in every state counts. Apportionment is a good idea in theory, but lousy in practice, as Obama would’ve lost to Romney that way last election despite having a substantial majority of the popular vote and an electoral landslide. I mean, it’s a good way of ensuring the party that controls Congress controls the presidency, though at that point we might as well revert to Madison’s idea and just have Congress elect the president directly. It would move us closer to Westminster which is another model I’ve grown fond of. And yes, this is a flip flop for me from 4 or 5 years ago if anyone wanted to do the digging, but Jeb! and the rise of Trump has shown us the limits of big money politics and I am less concerned that small states will be railroaded. Especially since we have a nationalized electorate now. Iowa voted for the anti-ethanol Cruz, the days where you could win Ohio by picking a native son and waxing poetic about buckeyes are over. That said, the electoral vote compact is still a really dumb way to do it. As it is today, Texas’ monkeying with voting rules doesn’t impact POTUS outcome a whit; same for Illinois. I’m quite happy with that, frankly. With a popular vote, Texas’ undemocratic voter suppression tactics might impact who gets elected President. Note: I’m picking on Texas. Insert your favorite VRA state or your favorite Dem machine state in its place. Part of the reason why Trump is at 50% is that he wandered south of the border, held events, talked to local officials and journalists. He was the one candidate who was smart and strategic enough to think that his visits to New Hampshire were also an excellent time to make friends in Massachusetts. I frankly don’t care whether or not the Massachusetts primary matters. Who was the last candidate or president that claimed NH as his or her home state? As nearly as I can tell, that honor goes to President Franklin Pierce — not exactly a household name. Three presidents were born in Massachusetts (John Adams, Hohn Quincy Adams, and John F. Kennedy) and Democratic Party nominees Mike Dukakis and John Kerry. President George H. W. Bush was born and raised here, and Calvin Coolidge spent most of his life here, including serving as Governor, even though he was born and buried in Vermont. I suppose that, for completeness, GOP nominee Mitt Romney needs to be included in the list as well. I don’t suffer from “primary envy”, nor do I resent candidates who focus their attention on New Hampshire. Nashua, Concord, and Nashua are readily accessible to anyone who wants to meet the candidates. I’m perfectly content to know that during my adult lifetime here, the political culture of my state seems to produce presidents and candidates — of both parties — on a reasonably regular basis. …was, I believe college roommates with Nathaniel Hawthorne, which gives the former the dubious distinction of having a roommate probably better known than he is, despite having been POTUS. and Pierce rewarded his friend with a patronage job as Consul to London, I believe. Another piece of trivia. Barbara Bush is a direct descendent of Pierce who was a pro-slavery Democrat I think. As Fred notes, Hawthorne and Pierce were classmates at Bowdoin. When Pierce ran for President, Hawthorne wrote his campaign biography, which was noticed in The American Whig Review with the comment in this title. Ouch. But it did win Hawthorne the patronage job in London. Were reportedly “there is nothing left to do now but get drunk” and boy did he ever! A very sad life, he lost his wife and a young child in office and never quite seemed up to the challenges of the time. It’s rather shocking in retrospect that we had sustained two-three decades of mediocrity in the White House immediately preceding and then immediately following the Civil War. My preferred solution would be to have all five New England states hold a primary on the same day, perhaps the week after Super Tuesday. It would give candidates some incentive to wander out of New Hampshire once in a while to visit the other New England states, and a reason to return after this group of southern states hold their Super Tuesday event. God’s own primary isn’t going to align with us regular voters. …FIVE New England states and talked about wandering out of NH to visit the others. He also suggested the week after Super Tuesday so we wouldn’t be muscling into NH’s precious gap before the next earliest primary. My preferred solution would be to have all six New England states hold a primary on the same day. It is a workable replication of the Electoral College. It gives some smaller states protection against a mass popular vote; at the end of the day, we ARE a Republic, not a Democracy. Certainly less corrupt and more representative than the super delegate system which only the Democrats have. There seem to be two conversations here running parallel to each other. Pablo commented on why it is wise politics for Presidential candidates of both parties to pay attention to MA in the pre-primary season. We are the source of money and bodies that regularly travel to NH to participate in both party primaries. And we regularly punch way above our weight class in donating to our respective party nominees, in post-primary season, especially if we like them during the primary season. A second theme arose about electoral votes and why the state is not worthy of being pursued by the national campaign, a generally good practice, not including locals who are concerned about down ballot races. These are unrelated subjects. Is there any way to separate these chats, or at least acknowledge that Pablo’s points are unrelated to the electoral vote issue?